Mrs Dragon's Den: Hullo Bread Machine! Over the last few years, the hubby and I have gotten more and more interested in making our own food, from scratch. First to go was pre-prepared meals, snacks, and brownie box mixes. Then store bought jams, salsas, spaghetti sauces, and pickles. The next item on our radar was bread. And ya'll, we eat a lot of bread in this house. My hubby is a carb happy snacker. Where I am more likely to reach for chips or nuts or whatever requires absolutely no preparation at all, he snacks on slices of sandwich bread, rolled up tortillas, and leftover rolls. To the point that, with just two adults in the house, we go through 1-2 loaves of bread a week. Plus any incidental tortillas, buns, rolls, etc. Enter the breadmaker from my grandmother. At this point I figure we have no reason to ever buy bread again. 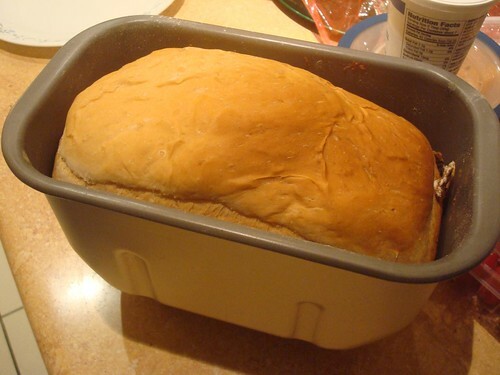 I usually make the weekend bread myself (a white flour bread, made with milk and butter instead of just water), but during the week I'm too lazy to make my own bread (and I don't want to buy so many types of flour as we would need to bake the same variety of bread as we buy). Normally the main ingredient is wheat, but in different degrees of "whole grainess" (I'm reaching my limits of knowledge of the English language here) Graham flour, or with groat; then breads made from spelt, rye flour, potato flour, corn flour. But to bake the variety of bread that we buy (sourdough, lye bread, whole wheat...) at home, I^m not sure my baking / cooking is good enough / is important enough for me. I try to bake something from time to time at home, and I try bread from the local bakeries instead of only buying from the supermarket (although supermarket bread is in general good here). It's just so easy to buy good bread, that's why I don't really feeel it's necessary to make it at home, except when I feel like baking. But it's also not for everyone. I just like hearing about how thinks work where you are because it's often different than what we have here. (We have a handful of "bakeries" and most do cakes/pastries not bread. In the supermarkets, I tend to buy organic bread. But even the non organic breads have no preservatives added; and ho hfcs. Here you can see what the bread selection of a local bakery looks like. ETA: That's even the bakery I worked in during high school ;).